Your prospect has downloaded one of your favorite pieces of content. You take a look in your marketing automation platform and see that they’ve been reading your blog and have spent quite a bit of time on your site. Clearly, this is a lead you’re excited to contact. The imperative question at this point is how do you effectively make that first contact. Push too hard, too early and you’re likely to lose an opportunity before it starts. Proceed too softly or timidly and you lose the benefit of such a strong lead. It’s a challenge that even the best demand generation organizations struggle with every day. When responding to an inbound lead, you must take an always be helping/always be teaching approach, not an always be closing one. Just because someone downloads something, doesn’t mean they have any interest or inclination to buy something from you. Of course, it doesn’t mean that they’re not interested either; so be sure you’re ready to go in any direction. The person downloading the content is not necessarily the person who is responsible for making purchase decisions. That, however, does not make them unimportant. Remember a very important rule of lead management: qualify the company not the contact. At Imagine, the next step we take with an inbound lead is making what we term “the connect call.” As its name implies, the purpose is to make a solid connection. The connect call is part of the discovery process. This means that you are still learning about whether the lead represents a good fit, and the lead is considering the same thing about you. This call is your opportunity to make that first impression on your prospect -- the first time that you're catching someone live on the phone. A connect call is about getting to know your prospect. We use a connect call in order to begin understanding who we’re talking to, what she cares about and whether we have anything in common that we can get value out of discussing. We ask questions to find out what she's working on, how that fits in with her company's greater business goals, what's tough about her day, whether that's something we can help with, and whether she even wants anyone's help in the first place. The connect call is NOT the time to flash your elevator pitch. This can take some discipline, because many times the prospect will insist that you provide one. If the prospect asks what you do, give them a high-level overview, and keep the focus on them. Resist the urge to talk about your product for 20 minutes straight. Practice conveying what you do in two sentences or less; then learn how to pivot back to inquiry. This is also NOT the time to budget-qualify someone. There are no shortcuts in a strong and thorough sales process, so we encourage you to over-invest in the front end of the sales process (it will save you time and money on the backend). While I’m about to break down the connect call, I want to emphasize that the whole of a connect is much more than the sum of its parts. It’s far more important to have a resonating conversation, where both parties learn, than to simply implement a technique efficiently. That said, when we teach/train on the connect call, we identify eight parts of the conversation. Keep your introductions short and sweet. When you're calling someone who's not expecting your call, her natural reaction is to feel guarded. She is assuming you're calling with an agenda, and will often be eager to get off the phone. Addressing resistance allows us to earn permission to continue the conversation despite this initial reaction. Remember at this stage the objective is simply to get a conversation started. So be prepared for resistance to keep the conversation going. The best way to do this is to develop several non-threatening, curiosity questions you can ask depending on the situation. Use the prospect’s recent actions as a conversation starting point. By referencing something the prospect has done, you are creating relevancy and are showing her that you've done your research and reminding her that she was, indeed, looking for help with something your company created content around. Caveat: This is not as easy as it used to be. So many sales vultures have abused inbound leads that prospects are weary. Be prepared to share insights of value that demonstrate that a) you’re worth talking to, and b) that you really have done some research on your lead. First principles: Be human first, and a salesperson second. 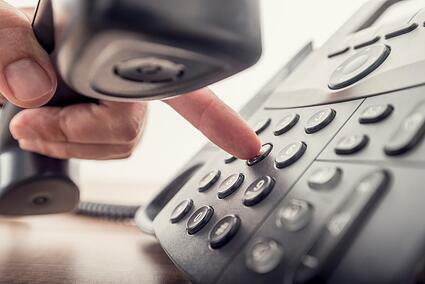 Your phone call can be an opportunity to liven up your prospect's day. Spend some time building rapport by bonding about anything you can find in common (and do your very best to find some unexpected commonality that’s more creative than today’s weather). If you have your prospect’s website open, look at what city they’re located in. Have you traveled there recently? Did you go to any fun restaurants while in town? Did you notice anything particularly charming about the architecture? Did your prospect grow up there or relocate for work? Have some fun getting to know the stranger on the other end of the phone. The more you can establish some sort of commonality, the easier it will be to lower the prospect’s guard and ask some probing questions down the road. Now that you’ve built some rapport, take the opportunity to naturally segue into some questions about their business and their job role. The more context you have, the better you can paint a picture of the world your prospect is operating in. This is where your buyer personas, industry and company research come in handy. You should already know what their most likely challenges and opportunities are, so demonstrate the insights you have and dig deeper. Positioning statements help you show your prospects that you understand their world. You’re showing them that you (and/or your company) have been around the block and that you’ve seen similar companies go through similar struggles. This is important as it’s what makes your prospect feel safe in sharing with you. For example, a common positioning statement I use is, “It really sounds like you’ve done an excellent job in serving your customers. It’s very common when we work with companies like yours, that while they’re great at delighting their customers, they’ve struggled building the pipeline and make the sales side as effective as delivery. It’s a common problem. I’m curious…” and lead into a question. Positioning statements are not one-size-fits all, and it's all too possible that the one you tried out doesn't resonate with the prospect. Have a list of three to four different positioning statements on hand. While positioning statements may lead the prospect to certain conclusions, short, open-ended follow-up questions allow prospects to continue the conversation and articulate their struggles in their own words. The shorter the question, the more freedom you provide your prospect for putting things in her own words. We’ve all been taught about the dangers of assuming. At this point in the conversation you’ll typically feel strong momentum and even positivity. It’s easy to assume that your prospect is ready to move forward. However, it’s important that you confirm that desire. You don’t need to be complicated here. I often use a simple confirmation statement like, “Would you like some help with that?” Whatever term you use, be sure to confirm before moving ahead. Be specific here. Set expectations properly. If you operate on a monthly sales cycle, encourage the prospect to take a follow-up call that same week. If you’re going to set up a GoToMeeting for your next phone call but don’t intend to demo your product, make sure the prospect knows what you do plan to cover during the next call and why that will ultimately be valuable for him. I hope this conversation was valuable to you. Do you want to schedule some time on Thursday of this week to dig a little deeper into what you're hoping to achieve within this facet of your business? That can give us a better opportunity to mutually assess if and how we might be able to help. See what you did there? You reminded the prospect that this conversation was about him, not about you. You set expectations about what you’ll cover during the next call. And even more importantly, you pointed out that sales is a two-way street, and that both parties should be mutually assessing one another to determine if it’s a good fit.